Anyone here ever use the "ADJ INT SIGNAL" feature on the BVM monitors? Adjust the color temperature with the bias and gain knobs. You can use the following probes for automatic adjustment of color temperature. Except for the Sony BKM-14L, a cable is required to connect the probe to the monitor. SIGNAL: Select the white signal to be used for adjustment. INT: Use an internal signal. Simultaneously with the adjustment of the gain and bias, the 100 IRE and 20 IRE signals are automatically switched. EXT: Use an external input signal. When adjusting the gain and bias, input the proper signal. So, all in all, I think that it simply affects the white balance of a built-in test pattern for manual adjustments of the color temp.. in what way, I have no idea. I might also be totally wrong - I'm not an expert and I don't even own a BVM. I was just bored.. I used the OSSC lat tester on PDP-V402 today using a rankie VGA converter. Bottom corner resulted in 6ms. Dang, I really could have used that. Does it work with the D-series BVMs? Perfect color accuracy is definitely not needed for gaming (even more so for 240p games, that may have been 'color corrected' with an NTSC Composite signal for all we know). Unless you were gonna use it to calibrate a BVM F24 for watching movies, in which case yeah that would actually be a shame. What do you mean by this? All games, with colors, have been drawn with RGB. Only time composite would even be relevant is if dithering is used, which is a completely different topic than color accuracy. Also keep in mind that most games that run in 240p have very limited color palettes. To deviate from those, when developing games, makes no sense whatsoever. Especially when you consider that the colors turns up different in NTSC and PAL when using composite video. First, I must say have zero knowledge about games development, so I actually ventured a bit further than what I should have had with that post. Still, I get that the games' visuals must have been coded digitally and have a definite color value in that context, but how does that translates once they are actually rendered by the consoles? Consoles that are probably not even able to output RGB natively, which is why nowadays we have people coming up with different palettes.. I don't know. I can't believe you need your display to hit an sRGB color chart with 99% accuracy for retrogaming, but I'm happy to be corrected if I'm wrong. Yeah, others have said that as well. But can it be used with D-series BVMs? Google results show that it'll work with the A, E and F series BVMs. But no mention of the D series. It works with the BVM D-series - says so in the manual. I have worked out this procedure after many years of calibration experience with the Sony BVM series monitors. The procedure is the same for HD or SD. That means 23.98psf for the most HD, and some 1080i 59.94 and the usual 525 for SD. 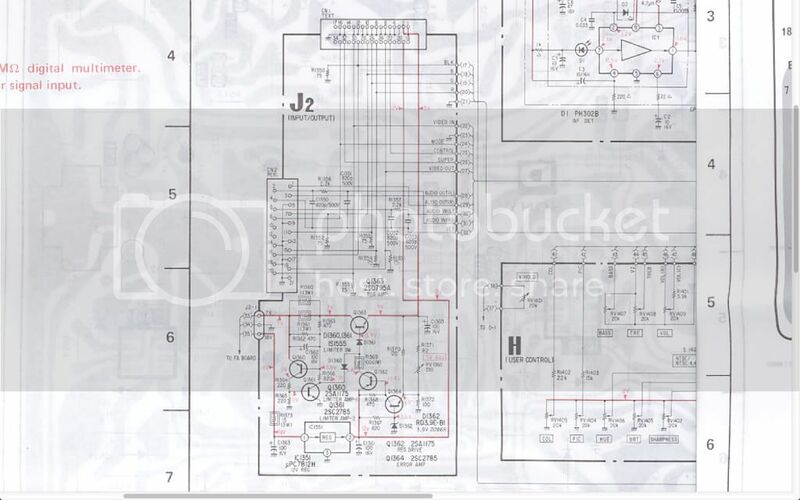 A serial digital path and optional input cards for the above monitors is assumed. I do not use the internal test signals for calibration, only for convergence. After configuring input, (use channel set only, do not attempt to copy from one channel to another, create a new channel for every type of standard or frame rate, SD, HD, NTSC, PAL,DI, etc. Using channel set only, means that you must manually configure and calibrate each individual channel. Turn on brightness hold. This is important. White field purity and convergence, sizing, for underscan / overscan, stable operating temp. (monitor stays on 24 / 7) are assumed to been achieved before color temp calibration is attempted. For the larger HD monitor, the optional Sony probe is needed to run Digital Uniformity alignment manually across the CRT. SD channels set for 4X3 underscan. HD channels set for 16x9 underscan. Perform the automatic adjustment using AUTO menu A12 in control preset. Apply 100 IRE window over black. Carefully position suction cup of Philips 5639 probe over white part of test signal, Correct setup, operation and calibration of philips meter is assumed. Use contrast / brightness control presets to set for 30 FTL on meter. Apply 20 IRE gray window over black. Set for 6500 K using magnify function on Philips meter. Go back and forth between white and black until target values are achieved. Set brightness for PLUGE, lower 2 chips to blend / disappear into other raster black, while clearly seeing the brightest chip of the 3 level PLUGE. There is some subjectiveness to setting the "black level" of the monitor by this method. Most agree pretty much, with the occasional colorist requesting the PLUGE to be set a little higher. There is always the option (and danger) of taking the monitor out of preset, (brighjtness only) for a session should the colorist desire. That creates the possiblity that the next operator might not notice. This should be the only reason why an operator would have to intervene with a calibrated monitor. Nothing else can be set by eye. If the brightness is changed to achieve black level according to PLUGE, you must go back and forth with the 100 IRE window to maintain 30 FTL The . 78 value is discarded in favor of the value set by EYE using the PLUGE as described above. The final check should be in blue only to confirm phase and saturation are correct I'm sure everybody has their variations and little tricks. I have found that deviating from using 20 IRE or 100 IRE is not necessary. If the CRT is in good condition the black point will track down to the darkest blacks. If it does not and you are sure everything was done correctly then it's most likely an indication that the CRT should be replaced. - Last caveat is that even if BVM's are known to be quite stable, they will still drift if left to themselves. So recalibration should be performed periodically, according to one's sensibility. I guess it's time for my annual post titled "just buy a colorimeter and spend an afternoon learning to calibrate" followed by "and then calibrate every screen you and your family own". 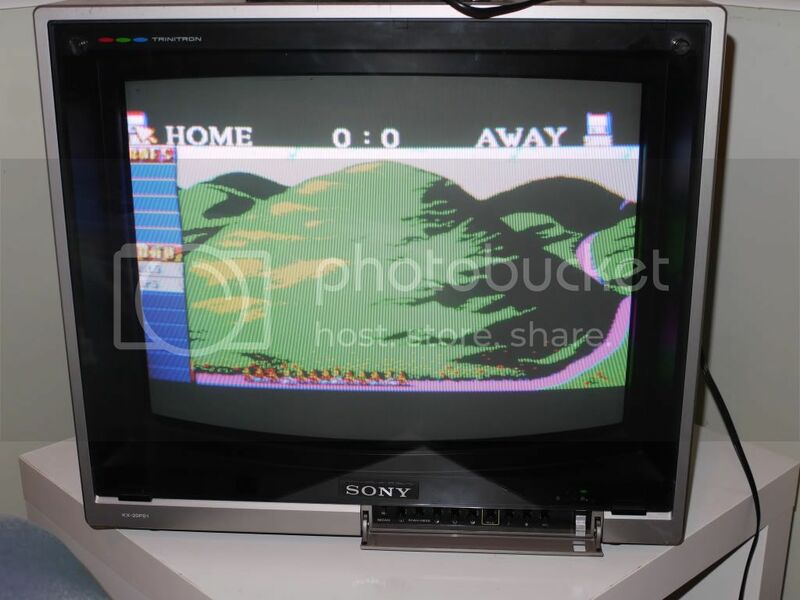 Does anyone know if you can switch between RGB and Component on a PVM 20L5 by pressing buttons on the front panel instead of going into the menu? Only if you have an RGB add in board. That the JVCs keep it on a separate channel appears to be an oddity. I suspect that's because a studio or whoever would probably never need to change it once it's setup. Yeah that makes sense, thanks. I saw a vid with someone doing it on 9" PVM and thought it was worth asking anyway. Hey guys, bit embarrassed to be posting a request for help as my first post but hey oh here we go. I'm trying to connect my Megadrive 1 to a sony kx-20ps1 using an rgb scart cable bought from retro gaming cables in the UK. I can get a stable picture but it's not sharp and the colours are either blown out or just incorrect. Here's a sample of what I am getting - the path should be grey & the colours on the hills are blown out & blocky. 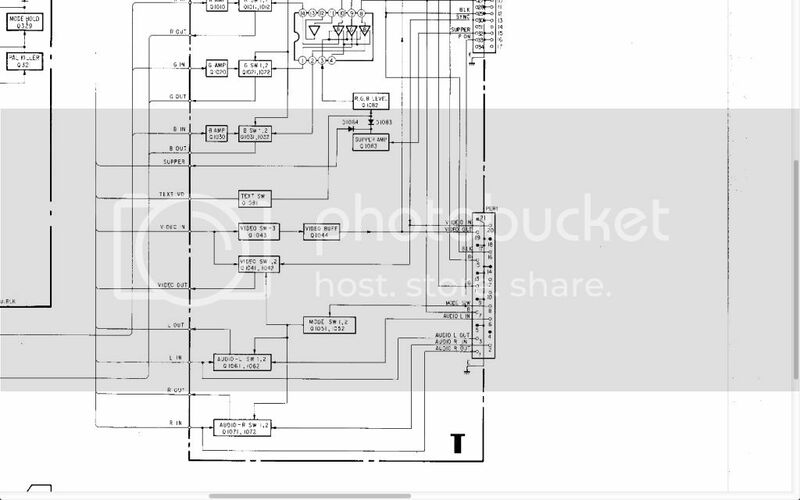 I tracked down a block diagram of the scart input just to confirm that it would accept rgb. Can anyone see anything non-standard with this that might cause the problems illustrated above. I have the same monitor as you have and have never been able to get a proper RGB picture with it, only composite seem to work properly. I have basically almost tried everything, RGB Scart from multiple Consoles PAL, NTSC, CSYNC, Composite Video as Sync and Official Cables, Retro Gaming Cables and even got a 34 Pin adapater for the RGB Multi Input connector (the one below the Scart input), nothing works and if it does work I get the exact same messed up picture with incorrect colors as you did. The only thing I haven't tried yet is the RGB DIN Multi Connector, but I doubt it would work either. Doesn't Rob on Youtube have a video which shows the Sony 20" Profeel running with both composite and RGB (while demonstrating the differences) ? Had some fun the other day testing a new phone camera and playing with the game-boy interface (component/YUV) on my pvm-14m2u. Looks awesome. I've recently put together a guide on running the GBI off a standard GameCube memory card which some people might find useful. What do I use I if want to hook up multiple consoles (HDMI, RGB, YPbPr) to a BVM through BNC? A switcher that accepts RGB and YPbPr, or two dedicated switchers with a BNC T-connector to same input. Hdmi will have to be converted to analog. Those Extron matrices do it all, they are big and bulky though. Anyone of you could tell me the best HDMI_TIMINGS for this kind of setup ? I'm writing here because the HDMI TIMINGS found in the web (retrorgb and a lot of other sites) seems to give some troubles. If i use the same HDMI_TIMINGS with and w/o EXTRON, i have 2 different output results. I bought EXTRON in order to use CSYNC on BVM, because i tried with a T (shame on me i know) and i had what we call flickering or similar, but in theory at 240P i should not have flickering...right? Using EXTRON i have the same "flicker" issue. I tried with sync on green and with Csync , used different BNC cables...same result. I tried different HDMI_TIMINGS at 240P, someone is better than other and i tried different Sony BVM (yes i know i'm lucky). Maybe is normal having also at 240P, that kind of trembling at the edges of the screen? It's annoying, i thought that with a good sync signal i should get rid off this issue. I see alot of BVM owners doimg this but why are you guys compelled to get a top $ broadcast crt and stick a laggy pi3 up its bum? Same reason people put Pandora boxes/PIs on Candy Cabinets, it jest werks. I know that this forum is not focused on emulation, about lag and so on, but there a lot of gamers with this CRT that could have experienced this. Finally got my hands on an OSSC to test it on one of my Sony FW900 Monitors. Never thought that I would really need an OSSC tbh. First I had some really bad noise using 5x line mode before I upgraded it to the latest offical 0.79 Firmware. Now its output is really impressing. Now obviously mine isnt anywhere near that bad, it's hardly noticable on stil images, but when im playing a game that scrolls, like Link to the Past for example, you can quite easily notice the warping of the image in that area of the screen. Is that fixable? and if so how? This is something that I haven't seen discussed enough but I hate to say this is the reason I have owned and sold so many bvms of the 20+ variety. It is pretty much on every one I have owned and is common and consistent enough to make me think that it's universal to the design of the tube or deflection. admittedly I have not changed any caps for this issue but I have swapped multiple boards of different ages with different units and this always persists. It's almost always in that spot of the screen you pointed out but it is much less exaggerated. The problem is that once I see it I can't unsee it. If you want to check for it try looking at the background gate of super castlevania 4 in stage 1-2 to watch the rails slightly compress and then release as you walk by. Another good one is the checkered pattern of green hill zone while moving slowly left and right. My advice for anyone with a bvm with a smidgen of OCD is to not look out for it in the first place. I picked up several BVM-20F1E's with ~15k hours on them and they all have this issue in that very part of the screen as well. Honestly I was really baffled to see the location of the screen being displayed here so accurately. I was afraid that the yoke was slightly displaced due to transport, but since all of mine have this problem and yours too, it must be a production error. Since these monitors were aimed at professional color applications for the film industry, I can understand why Sony got away with it. You really don't notice it unless playing any sort of side scrolling game. I was playing myself some 3D PS2 games and had 0 problems with it, but 10 seconds of playing a platformer and it's very noticable. From what I've seen the D24 and D32 have insanely good geometry and linearity in comparison. I can't even get a perfectly square picture with an underscanned game and from what I've seen from photos the D24 had fixed-pixel-like geometry and linearity. I noticed this too in my D20F1U soon after I started using it. It bothered me a bit at first but it didn't take long for me to learn to ignore it most of the time. The great performance of this monitor in so many other regards makes this an acceptable trade-off IMO. The D24 has its own trade-off, with what is in most accounts perfect geometry at the cost of a noticeable smaller 4:3 image (though I imagine also a bit sharper than the 20F1s, with 100 more lines AND being smaller). The D32 is probably the best of all possible worlds, though it too has its trade-offs (especially its insane cost and insane weight).